Today, I harvested 21 greenpee seeds, and then cut em all down. I will cut 2 out of 4 moringa down, simply have no space. Will keep 1 tomato plant. Replanted sallad and leak. Will keep seeds and frutlings more or less under shadow.-..
Reading seekingalpha.com who states we're already in a Recession. Ah well. Izza way it goze. Finished picking flowers in the daily chores at the Library. Supposed to get new sink parts today. Hoping before noon so I can finish up. New ToDoList has expanded to two full pages. Many small jobs, a few big ones to tackle. Weather is sunny & nice outside, not too cold today. Friday December 21, 2018 - Today is Winter Solstice; the shortest day and the longest night of the entire year. It is early, I am planning my day ahead and will edit later if I decide to do anything preparatory towards the GSM. I got to thinking, JD Rockefeller was the project & funding man & owner of the crowded Tenement Slum housing in NYC etc back in the early 1900s. Megacity housing is Stack N Pack, would it be any better than Tenements, in the long run? Go back and read the story of Joseph and the pharaoh in Genesis in its entirety. You'll see there is precedent for this. Hey dirt, back several years ago, I'd read a good book "Trapped in a Freemasonic World" and it is spot on. I'd have to look to see if I can find it in my HDs, I'd never gotten around to uploading to archives. After reading it, I'd come to the conclusion, much like Joseph that we're all still trapped and ruled by the new Pharisees aka Pharoah of the Masons. All that is left is the (cautiously whispering---> (prisons)). It is so suppressed, no one will figure it out unless they want to spend the time to do so. Sad our neighbors were from indonesia and they hadn't heard from some of their loved ones last night. 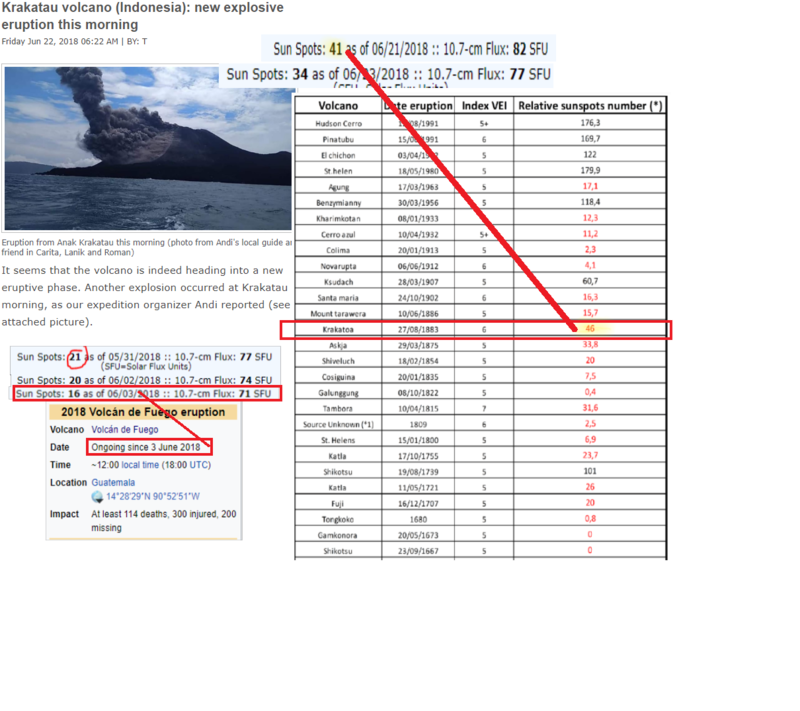 I've been tracking krakatau since the kilauea event this year, as soon as sunspots dropped, it started increasing activity. I'm going to post a PDF here in the PDF zone soon showing the correlation between GSMs and large VEI/seismic uptick in activity during them. As far as what I've been doing to prepare, I've been fasting a lot. Slowly working my way to a week with no food. I dropped 7lbs in 2 days doing this but gained it back thanks to some ganja, trying to prepare myself for what it's going to be like to live with hunger pangs. Working on my third firewood crib here as well, and bought some tools so I can sharpen my own chainsaw blades in the future. Oh and figured out my chainsaw has a freaking chain bar oil reservoir I never knew about, so filled it up with Canola oil and we're good to go now! Tip: Canola oil is best in the winter, vegetable oil is for the summer for anyone with one/looking to get a chainsaw. I haven't looked yet for updates on the Tsunami. It is scary and I hope your neighbors hear something good soon. Dr Omar Zaid lives in Indonesia, I'm heading over to his feed later. Right on! Fasting does require a certain mind set to be successful. When I was in my mid 30s, I fasted for 39 days on only water. After the 8th day, I was curiously calm in both mind and body, a feeling I'd never experienced before. But, I later learned that feeling of calm is caused by a fully "tuned" up primary energy given from only fat burning metabolism as opposed to the starving zombie like neurotic highs and lows caused by "carb" only metabolism and the feast versus famine no food available scenario. I'd touched on that fat vs carb burning metabolism topic in PDF Zone. In my last RN career, in one particular flu/pneumonia season, after watching 3 to 6 elders die each year for the previous 4 years and every danged one get deathly sick with the green lung yogurt thick exudate, I volunteered by refusing to get involved with giving the vaccines to 120 elders one year in a nursing home. Psychology is so cool. By my refusing to agree peacefully to give vaccines (verbally) all the other RN's ganged up on me and had management force me to give the vaccines to the 120 elders. Ah HA! Psychology worked well, so that was too cool. So I proceeded to act like I was annoyed. I did NOT give any elder who lived in the nursing home any of the two vaccines, but SAID I gave it. NOT ONE ELDER DIED, NOT ONE ELDER GOT SICK THAT ENTIRE WINTER SEASON!!!!!!! The doctors, the hospital and the rest of the businesses involved in sick care were LIVID. The EVIL Management at the nursing home demanded repeatedly INTERROGATING ME FOR over 3 months, "DID YOU GIVE THE VACCINES?!?!?!" I know about ALL the vaccines. Now, you know too. The end of the story, I had to run for my life for several years. That story, has not ended, yet.